2014 was a great show season for MillDuck. We attended 9 shows, winning 37 Broad Ribbons. Whilst we had a number of stars winning broad ribbons, the brightest star was MillDuck Quinlan who won two Supreme Championships – two very special moments. 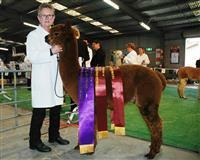 On two other separate occasions we had our coloured alpacas in the final two or three under consideration for Supreme Champion – suggesting our coloured genetics are as good as the best. 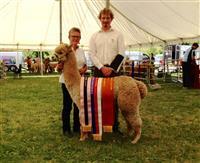 MillDuck Oregon (brown male) continued to impress the judges winning Premier Brown at AlpacaFest. Oregon has won 20 Broad Ribbons during his show career from a Junior through to senior. A record which speaks for itself. 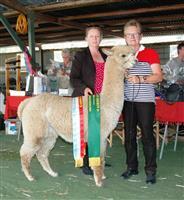 Pentland Giorgio, our new stud male, won Champion Adult Male at Sydney Royal Show and Premier Medium/Dark Fawn at AlpacaFest. Giorgio went on to win the highly competitive Senior Medium/Dark Fawn Male Class at the AAA National Show in Bendigo – proving he is holding his fleece qualities having won the Adult Medium/Dark Fawn class at the 2013 National. We can’t wait to see Giorgio and Oregon’s first progeny which will arrive in autumn 2015. Read on to see the performance of individual MillDuck animals at the 9 respective shows. We are very proud of these results reflecting the depth and success of our coloured breeding program. MillDuck Oregon Reserve Champion Senior Male Best Brown Male Premier Brown. Goldleaf Regal Ettiquette ET Reserve Champion Junior Female. MillDuck Rosenvelt Champion Junior Male. MillDuck Quigli Res. Champion Adult Male Best Brown .